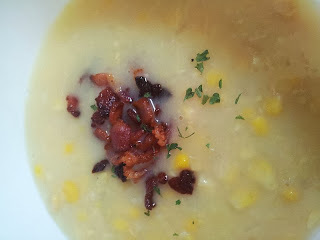 Was thinking of a title for this post and thought just "Corn Chowder" would be boring so instead, I added the word "Grandma" to it and it kinds of authenticate the whole recipe and makes it more enticing to cook it, doesn't it? So frankly speaking, it is not my grandma's recipe as I have never tasted her cooking or seen her step into the kitchen when she was still around.. Anyway, this is a very easy recipe to try it out especially if you children love corn. 1) Fry the bacon till crispy. Set aside. 2) Saute onions in leftover bacon oil. Add potatoes and water to simmer until potatoes are tender. 3) Stir in the milk, corn, salt and pepper to taste. Stir frequently until heated through and mixed thoroughly. 4) Finally, garnish it with your bacon and parsley (if you have)! How easy can this be?